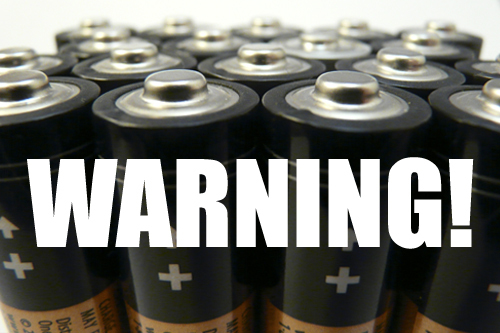 If you’ve ever looked at the fine print on a pack of batteries or on battery powered products you’ll find an array of warnings about how to use batteries properly. You are cautioned not to mix battery types, brands, or old and new batteries, and so on. But do you need to take these warning seriously? To most consumers a battery is a battery. If it fits it works. But we’re here to tell you why you might want to be a bit more cautious next time. Don’t mix battery chemistries. Carbon-zinc, alkaline, lithium, silver-oxide and the other battery chemistry types don’t get along. Using batteries of different chemistries to power a product can cause damage to your device from electrolyte leakage and over-discharge of the lower capacity batteries. Basically it makes a mess and eats the battery contacts, potentially ruining your product. Don’t mix rechargeable and non-rechargeable. This is an extension of the “don’t mix chemistries” warning with an additional consequence: it could permanently ruin your rechargeable batteries. And be sure to keep in mind that lithium (non-rechargeable) and lithium-ion (rechargeable) are in fact different chemistries. Don’t mix battery brands. This is a bit of an urban myth. As long as batteries are the same size and within the same chemistry category (all lithiums, all alakalines, etc.) they are largely interchangeable. A product could run comfortably on a set of four alkaline C batteries even if they each came from a different manufacturer. Just remember that the lowest quality battery may limit the product performance and waste some of the value of the more premium batteries. Don’t mix old and new batteries. So you’ve obeyed the warnings up to this point, but now you need three batteries and you only have two fresh ones. Why not just pull a six-month-old AA out of the TV remote? Mixing batteries with different charge levels can dramatically decrease battery life. As the product is used the charge in each battery drops, and the battery with the lowest charge will die first. At this point the dead battery becomes another electrical load within the product. The dead battery consumes part of the electrical charge from the other batteries before it ever has a chance to do any work for you. Worse yet, there is also a risk that the dead battery may leak.